As of today, December 12th, this site has been on-line for seven years. 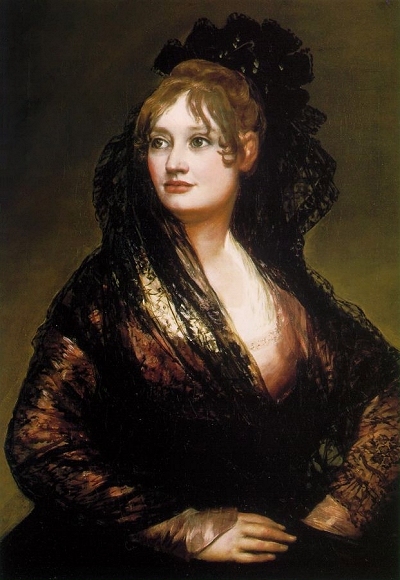 And perhaps the most appropriate way in which to mark the occasion is to pay tribute to one of the most remarkable incarnations of plus-size beauty in the history of Western art, a goddess whose loveliness was immortalized for all time in a masterpiece by the Spanish Romantic painter, Francisco Goya. \r\nWe know very little about Doña Isabel de Porcel, the Spanish noblewoman who sat for the most famous portrait of Goya\'s career. But we do know the effect that her voluptuous beauty has had upon everyone who has ever laid eyes on her. The black of the dress and transparency of the veil accentuate the contrast of the luminous décolleté and sensual face. The fleshy mouth, large eyes, even and bold features give the figure an elegance that is both simple and sensual. In this painting the artist manages to convey the passionate vitality of the woman. The writer couldn\'t help but use the word "sensual" twice in the same paragraph--and who could blame him? \r\nThe painting was recently part of an exhibit titled "Favourite Smiles in Art," and the British newspaper The Guardian also penned a description that features the word "sensual" twice in three sentences, similarly refers to her "vitality," and twice mentions "flesh" and "fleshy," as if, at a second glance, her fleshiness is even more visible than at first. Doña Isabel\'s smiling lips are belied by her anxious and pensive eyes. Her mind must be elsewhere. She is clearly a sensual being, an active participant in the contest of passion, not a mere passive object of the gaze. Isabel de Porcel is wearing an elegant and fashionable \'maja\' dress from her native Andalusia. The black dress accentuates the contrast with her luminous flesh, her sensual face, her fleshy mouth, her large eyes, her clear beauty. Underneath the aristocratic appearance there is vitality and personality. Doña Isabel wears the dress of a maja - a style originally associated with the demimonde of Madrid, but in the late eighteenth and early nineteenth centuries adopted by ladies of fashion as a token of Spanish patriotism, and also, no doubt, because its black lace mantilla and high waist were madly flattering, as we can see here. Goya emphasizes Doña Isabel\'s best features, her eyes and her fresh colouring . . . the incipient double chin adds to her youthful charm. What is particularly telling about these passages is their approving descriptions of the Doña\'s visible softness. The writers find themselves intoxicated by her beauty precisely because she is full-figured, not despite this fact. One doesn\'t have to take much of a leap of imagination to suspect that Goya enjoyed this particular assignment perhaps a little bit more than Dona Isabel\'s husband might have liked. Goya had, as do many men, a particular \'type\' that appealed to him. Perhaps Dona Isabel approached it more closely than most. At any rate, what was meant to be a portrait has been elevated, here, into the stuff of full-bodied sexual fantasy — the slightly damp-looking curls, the flushed cheeks, the plump bosom only just encased within the black lace shawl, the remarkably full lips — and, most notably, those impossibly huge, luminous . . . eyes. Again, note that his adjectives ("full-bodied" "plump") all clearly affirm the well-fed richness of the Doña\'s figure, but acknowledge these as the very qualities that make her so irresistible. The reason for mentioning this portrait is her voluptuous beauty. Women, most women, after one hostile glance say she\'s f_t. Men who come upon Doña Isabel for the first time stop as though hit with a club. She\'s two centuries old. Nobody cares. Goya saw a radiant succulent woman who enjoyed being a woman who enjoyed men and that is what he painted. Two centuries from now Doña Isabel will stop traffic. Again, note the writer\'s specific reference to her opulent appearance (a "radiant succulent woman"--breathlessly written, with no comma), and his peremptory defensive strike against those who dare to dispute her beauty. The descriptions that this masterpiece evokes catalogue the true qualities of a plus-size goddess: proud, vital, passionate, aristocratic, soft, sensual, languid, pampered and irresistibly spoiled, extremely conscious of her own allure, and possessing a consummate fashion sense that enables her to adorn her sumptuous figure in a way that is "madly flattering"--i.e., stylish and chic, but vividly accentuating and emphasizing her curves. \r\nIt is no wonder that the mass media not only suppresses plus-size beauty, but also obliterates from public view any goddesses who possess the character attributes noted above, choosing instead to present vulgar caricatures who are either empty-headed, or consumed by self-loathing, or both. \r\nA true plus-size goddess is more than just a challenge to modern notions of beauty. She is, by her very existence, a repudiation of the entire value-system on which the modern world is based, with its myth of uniform "equality" (i.e., sameness), and its remorseless levelling agenda. \r\nA plus-size goddess inspires an intense longing in mankind, a quest for something better, a yearning after a transcendent goal. She shows us that there is more to life than mere existence, that we are meant to pursue loftier ends than merely determining how to distribute our rations. She reminds us that if humanity concerns itself with nothing beyond the welfare of the lowest common denominator, it sentences itself to collective slavery. \r\nA plus-size goddess proves that there are living deities among us (with herself preeminent among them), that humanity itself has heights, and dignity, and splendour, and majesty. She compels us to strive for more, because she herself perpetually wants--and deserves--more. \r\nYou can see it in Goya\'s painting: in her breathtaking self-assurance, the Doña tells us that, great as her painter may have been, the greatest moment of his life was right there, in her presence, when she allowed him the privilege of preserving her beauty for all time--her beauty, and the insatiable desires and vital passions that animated it. \r\nThe aesthetic restoration is bringing back more than just the ideal of beauty of which mankind has been deprived, for far too long. It is bringing back the Faustian glory of the Western tradition, for which that beauty-ideal served as the utmost goal, throughout history. Happy anniversary, congratulations on keeping the site and forums up, and thank you for all of your hard work in restoring the truth about timeless beauty and how women can feel about their natural shapes. This portrait is one of my own favorite Goya pieces. \r\nA woman who enjoys being a woman...that is the positive message I receive from great art like this, much more effective than all the empty, materialistic slogans from advertising and popular culture that seem liberating but lack real heart and soul. "Goya emphasizes Doña Isabel\'s best features, her eyes and her fresh colouring . . . the incipient double chin adds to her youthful charm." \r\nHow refreshing to see a writer praising this feature so specifically. The authors all seem to be falling over themselves in their praise of the lady\'s charms. I think their reactions show just how potent beauty can be, in overturning modern standards of thinness, and reawakening an appreciation for lush womanliness. No wonder this kind of beauty is suppressed in the modern world. It obviously IS very subversive, and inspires a discourse that is very pro-curvy. \r\nBut how sad if the last writer is correct, that some women tend to criticize the lady in the painting for looking full-figured. It shows how deeply ingrained modern aesthetic brainwashing really is. This painting has been admired for centuries, but a steady barrage of magazines and TV images has warped the eyes of these modern beholders, until they can no longer recognize true beauty. "Goya had, as do many men, a particular \'type\' that appealed to him. Perhaps Dona Isabel approached it more closely than most...At any rate, what was meant to be a portrait has been elevated, here, into the stuff of full-bodied...fantasy." \r\nThe writer quoted by HSG makes an interesting point, but considering how universally this lady has been admired throughout the centuries, I would say that she represents not just Goya\'s "type" in particular, but a more universal ideal of beauty -- in fact, the timeless ideal of beauty that is often discussed on this forum. The fact that her facial features exhibt the babylike roundness that epitomize femininity (as a scientific study that recently came up for discussion at this forum indicated), would support this theory. \r\nIt\'s interesting that she inspires such ardour, and yet is dressed in a demure (although feminine) way. That supports another hypothesis that has been mentioned on this forum -- that it is the androgynous standard which has led to the vulgarization of mass culture, as models with diminishing charms have had to expose more of themselves, in order to achieve any kind of reaction. Fuller-figured models in other centuries could inflame public passion with just a taste of their opulent beauty, as suggested by a close-fitting dress and generous decolletage. It\'s so frustrating to think that women, rather than men, are the only individuals who criticize this painting, because of the model\'s opulent beauty. But it confirms something that I\'ve long suspected about how the anorexic standard gets reinforced. I\'ll bet quite a few underweight women latch onto it as a way to criticize the appearance of "voluptuous vixens," whose beauty they secretly ENVY. \r\nIt makes sense, if you think about it. Deep down, thin women may feel inadequate by comparison, so no wonder they\'ll eagerly adopt a value system that tells them how to criticize the full-figured femininity which they secretly long for, and are jealous of. \r\nIt\'s "sour grapes" on a societal scale. \r\nWhat they are really saying, when they confront a timeless masterpiece like this (or a plus-size model) is, "How dare she be so beautiful?" "The black dress accentuates the contrast with her luminous flesh, her sensual face, her fleshy mouth, her large eyes, her clear beauty. Underneath the aristocratic appearance there is vitality and personality." \r\nIts so interesting that this lady is described as "sensual", AND as having an "aristocratic appearance". Both are true, but it shows just how much the idea of aristocracy has changed in our time. Today, high society and aristocrats are always depicted as being cold and brittle and patrician. But Goya presents Dona Isabel with warmth and passion in every inch of her being, yet as someone who still has class and dignity. \r\nThat kind of aristocratic dignity and self-possession is totally missing in TV depictions of plussize beauty today. Maybe thats what makes the few really great plussize models so compelling - they have it. \r\nSo nice to see a writer describe a double chin as "youthful". But it really is! No matter what the media today says, this is a "cute" feature, and when a woman loses this, her face starts looking old. We know very little about Doña Isabel de Porcel, the Spanish noblewoman who sat for the most famous portrait of Goya's career. But we do know the effect that her voluptuous beauty has had upon everyone who has ever laid eyes on her. The writer couldn't help but use the word "sensual" twice in the same paragraph--and who could blame him? The painting was recently part of an exhibit titled "Favourite Smiles in Art," and the British newspaper The Guardian also penned a description that features the word "sensual" twice in three sentences, similarly refers to her "vitality," and twice mentions "flesh" and "fleshy," as if, at a second glance, her fleshiness is even more visible than at first. Doña Isabel's smiling lips are belied by her anxious and pensive eyes. Her mind must be elsewhere. She is clearly a sensual being, an active participant in the contest of passion, not a mere passive object of the gaze. Isabel de Porcel is wearing an elegant and fashionable 'maja' dress from her native Andalusia. The black dress accentuates the contrast with her luminous flesh, her sensual face, her fleshy mouth, her large eyes, her clear beauty. Underneath the aristocratic appearance there is vitality and personality. Doña Isabel wears the dress of a maja - a style originally associated with the demimonde of Madrid, but in the late eighteenth and early nineteenth centuries adopted by ladies of fashion as a token of Spanish patriotism, and also, no doubt, because its black lace mantilla and high waist were madly flattering, as we can see here. Goya emphasizes Doña Isabel's best features, her eyes and her fresh colouring . . . the incipient double chin adds to her youthful charm. What is particularly telling about these passages is their approving descriptions of the Doña's visible softness. The writers find themselves intoxicated by her beauty precisely because she is full-figured, not despite this fact. One doesn't have to take much of a leap of imagination to suspect that Goya enjoyed this particular assignment perhaps a little bit more than Dona Isabel's husband might have liked. Goya had, as do many men, a particular 'type' that appealed to him. Perhaps Dona Isabel approached it more closely than most. At any rate, what was meant to be a portrait has been elevated, here, into the stuff of full-bodied sexual fantasy — the slightly damp-looking curls, the flushed cheeks, the plump bosom only just encased within the black lace shawl, the remarkably full lips — and, most notably, those impossibly huge, luminous . . . eyes. Again, note that his adjectives ("full-bodied" "plump") all clearly affirm the well-fed richness of the Doña's figure, but acknowledge these as the very qualities that make her so irresistible. The reason for mentioning this portrait is her voluptuous beauty. Women, most women, after one hostile glance say she's f_t. Men who come upon Doña Isabel for the first time stop as though hit with a club. She's two centuries old. Nobody cares. Goya saw a radiant succulent woman who enjoyed being a woman who enjoyed men and that is what he painted. Two centuries from now Doña Isabel will stop traffic. Again, note the writer's specific reference to her opulent appearance (a "radiant succulent woman"--breathlessly written, with no comma), and his peremptory defensive strike against those who dare to dispute her beauty. 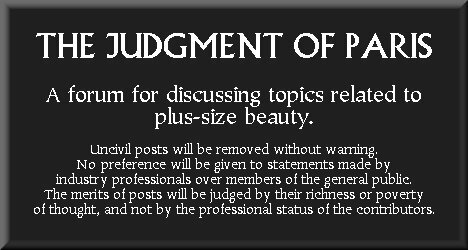 It is no wonder that the mass media not only suppresses plus-size beauty, but also obliterates from public view any goddesses who possess the character attributes noted above, choosing instead to present vulgar caricatures who are either empty-headed, or consumed by self-loathing, or both. A true plus-size goddess is more than just a challenge to modern notions of beauty. She is, by her very existence, a repudiation of the entire value-system on which the modern world is based, with its myth of uniform "equality" (i.e., sameness), and its remorseless levelling agenda. A plus-size goddess inspires an intense longing in mankind, a quest for something better, a yearning after a transcendent goal. She shows us that there is more to life than mere existence, that we are meant to pursue loftier ends than merely determining how to distribute our rations. She reminds us that if humanity concerns itself with nothing beyond the welfare of the lowest common denominator, it sentences itself to collective slavery. A plus-size goddess proves that there are living deities among us (with herself preeminent among them), that humanity itself has heights, and dignity, and splendour, and majesty. She compels us to strive for more, because she herself perpetually wants--and deserves--more. You can see it in Goya's painting: in her breathtaking self-assurance, the Doña tells us that, great as her painter may have been, the greatest moment of his life was right there, in her presence, when she allowed him the privilege of preserving her beauty for all time--her beauty, and the insatiable desires and vital passions that animated it. The aesthetic restoration is bringing back more than just the ideal of beauty of which mankind has been deprived, for far too long. It is bringing back the Faustian glory of the Western tradition, for which that beauty-ideal served as the utmost goal, throughout history. Last edited by HSG : 13th December 2005 at 07:23.